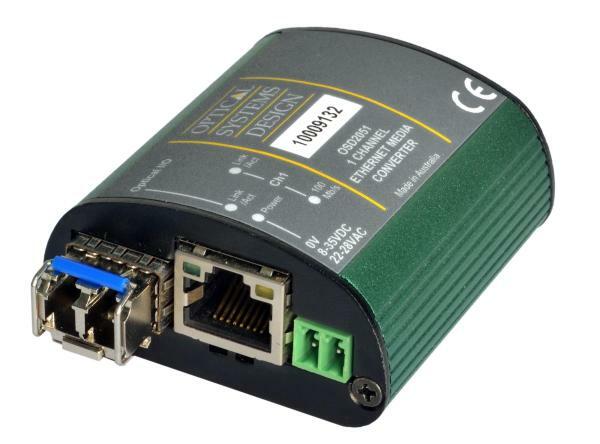 Complies with the IEEE 802.3 standard. Supports network traffic of 10 or 100Mbps. Automatic TP setup: no need for crossover cables. Auto-sensing of half or full duplex operation. Automatic setup for 10 or 100Mbps on copper side. A very compact design that fits in the camera housing. Available for singlemode, multimode operation over a variety of link budgets. Available for operation over 1 or 2 fibers. Powered by non-critical 12VDC or 24VAC supplies. Utilizes 10/100Base-Fx SFP transceivers that can be selected according to specific length or fiber requirements without changing the whole unit.